Do you homeschool or add after school enrichment activities to your child's day? Are you looking for supplies on a budget? Look no further! Here are five of my favorite manipulatives for early learning. It took me about an hour to make all five, and the only supply I purchased specifically for this project was magnets. I've mentioned most of these at one point or another in my Tot School and Tot Preschool posts, and I thought it would be nice to post the specific details in one place for anyone interested in the details. These are self explanatory. I washed and saved milk caps until I had enough to make the full alphabet. I wrote each letter on a cap with a Sharpie . Eventually I saved enough for one set of capital letters and one of lowercase. These are great for letter matching, beginning sounds exercises, word family games and more. Even better, they can be used for more than just alphabet games. They can be sorted by color then graphed. They can be stacked. They can stand in as place markers for homemade games and much more. These didn't even take five minutes to make. All I did was write a letter on the head of each clothespin . This set can be used for letter matching and beginning/ending sound games, and it is great for fine motor development. My three year old needs more practice with these. These are probably the favorite are here. My boys, especially J-Bug who is three, could play with these every day. He loves pom poms in general, so pom poms with magnets are the bees knees to him. The benefit to using pom poms as manipulatives is the texture. The added sensory stimulation pom poms provide helps children retain what they are learning. I've seen these on many blogs. I think the original idea came from Mama Jenn. Pom Pom Magnets are simple to put together, although out of all the manipulatives, these and the gems below were the most time consuming. All you need are pom poms , a glue gun and sticks , and craft magnets . This is our second set. For the first I used magnets that were much stronger, and the pom poms pulled apart after just a few months. This time I got smaller magnets without as much strength. (But still enough!) They are adhesive backed, but I used hot glue to reinforce the adhesion. These were made exactly like the Pom Pom Magnets. I got the idea to use glass gems from 1+1+1=1. I made two sizes and vary which I use depending on the project. These are terrific for developing the pincer grasp. I use them in similar exercises as I use the Pom Pom Magnets. These ones take more strength and precision of grasp than the pom poms, so I like to alternate which I use. I made two sets, so my boys can make two digit numbers by place the blocks side by side. Before too long I will write out "thirty-two" on the bottom block and have JZ (who is five) find the 3 and the 2 to put together. I might end up buying another set of Duplos, because the list of possibilities with these is sky high. 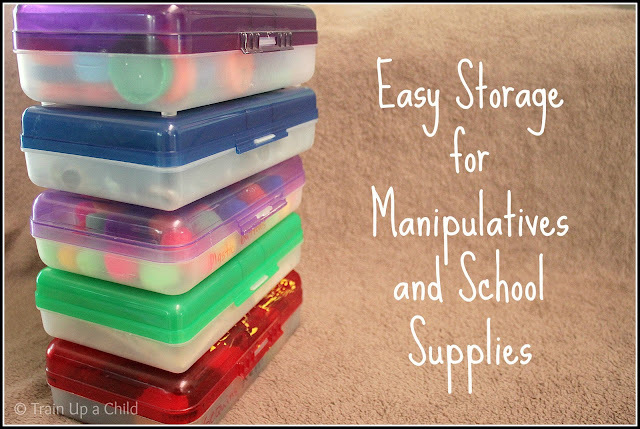 Each set of manipulatives is stored in these pencil boxes . These can be found at Dollar Tree, Target, or any school supply store. I just bought two more the other day in the clearance section at my local grocery store! Stay tuned for ideas for uses and multi sensory learning suggestions for these DIY manipulatives. I love hands on learning and have lots of ideas to share! For more ideas follow my Preschool Ideas board on Pinterest. Wow, those are so helpful. I love how you used items you already had and they are inexpensive enough even if you don't already own them. Just pinned this! I like how your stored these in pencil boxes. I need to stock up! Thanks for linking up to Learn Through Play linky this week. These are some great ideas. I hadn't thought to # our blocks. Going to try this. Great ideas!! Thanks for sharing! Visiting from Show and Share Sat(although I follow you on GFC too) I too use these awesome school supply boxes for lots of storage. I love the pom pom magnets! That is definitely something I'll be making this year with my class. I Love all these ideas! I would like to remind everyone however to never allower small children to play with the magnets unless they are being VERY closely supervised. if swallowed the tiniest magnet can cause major problems (even death) Not bashing the Post, I think its great! Just a friendly reminder. 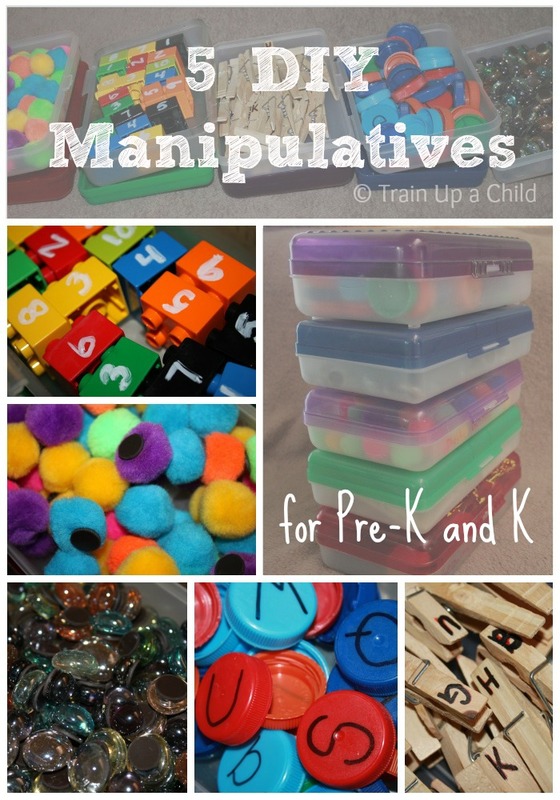 Great list of manipulatives. I never thought of putting magnets on pompoms. Great idea. Oh the possibilities. Thinking how you could use the colors of the block numbers later on to explore place value too! we love our milk cap lids for this same reason! so awesome! and for more manipulatives....now i'm trying to figure out what i have that i can stick magnets to. you've got me inspired, mama! thanks again for linking up to tip-toe thru tuesday! WOW! I would never think of something like this. I'm keeping my daughter home for Pre-K and I'm having the hardest time. I'll be doing some of these now. Thanks for linking up to tip-toe thru Tuesday! I recently wrote letters on clothespins and put a clothesline at his level below where I hang out our clothes to dry. It has been a big hit. Fantastic lineup of manipulatives and follow up activities. I'm sharing on the Kids' Co-op Facebook page Tuesday. Thanks for linking up!! Great list! I'm one of the co-hosts of the Weekly Kid's Co-op and will be featuring this tomorrow with the link up. Wow! Those ideas are really brilliant. This has really a big help for parents as well as the teachers. I am sure that kids will enjoy those activities. Thanks for sharing. I would love to hear some ideas on how you use the pom poms. I can't wait to make them. In my classroom, we have a large magnet board near our grouptime area. Each day, we have a question the children need to answer such as "which arctic animal do you like best?" The children then place a pom pom under one of the columns I've listed. We predict which column has the most, the least and then count them to see if we were correct. It is a quick and fun way to bring mathmatics into their day. Just the perfect ideas on educating children while having fun. Learning can definitely be fun with these tips.